If you missed us at Project Limited, don’t despair! We’ve put the remainder of the limited colors of these great new men’s and women’s hairs In-World at Damselfly. Get here now to get your color because once they are gone, they are gone! If you missed us at Hair Fair, don’t despair! We’ve put these fabulous new men’s and women’s hairs In-world and on Marketplace. 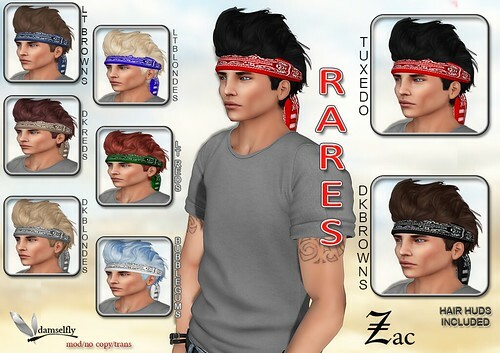 Two new hair pieces have been added to the store and Marketplace, one for men and one for women. Carter is a tufted men’s ‘do with hairbases and Kandi is a medium-length look with hair braided in front. 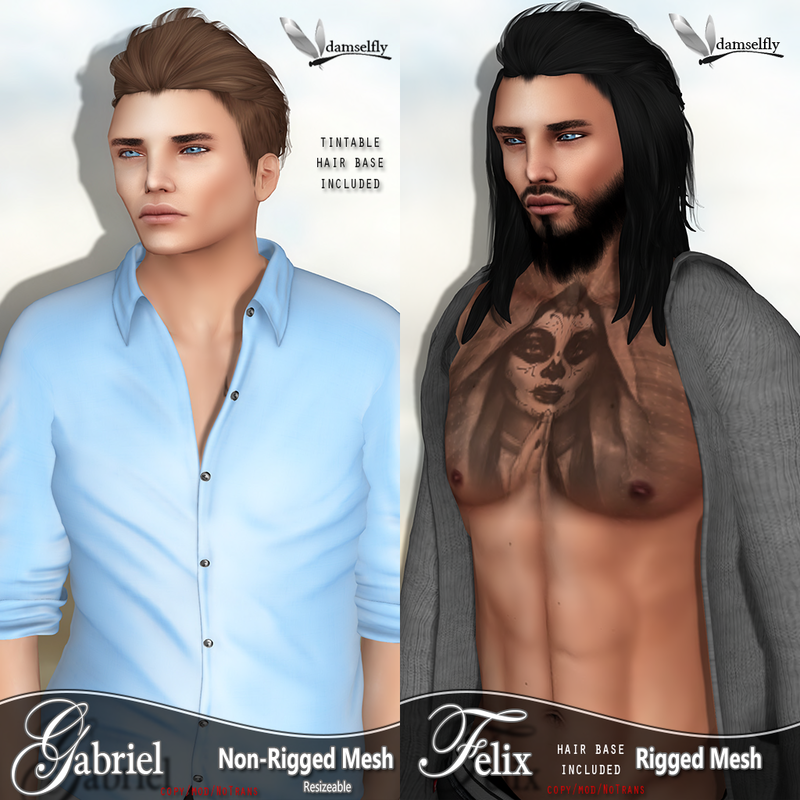 Both come with our improved texture-change HUD and are available in-world at our store at http://maps.secondlife.com/secondlife/Damselfly%20Hair%20Salon/203/191/31 or on Marketplace at http://tinyurl.com/damselfly-carter-on-mp for Carter and http://tinyurl.com/damselfly-kandi-on-mp for Kandi. Damselfly is proud to be a participant of the Surf’s Up Gacha, and we are offering these two hairs in our gacha with a chance to get the rares with special-colored bandanas. Visit the Surf’s Up Gacha (http://maps.secondlife.com/secondlife/Nice%20and%20Naughty/76/150/23), which is open from July 21 to August 3 and take a chance on winning a rare!